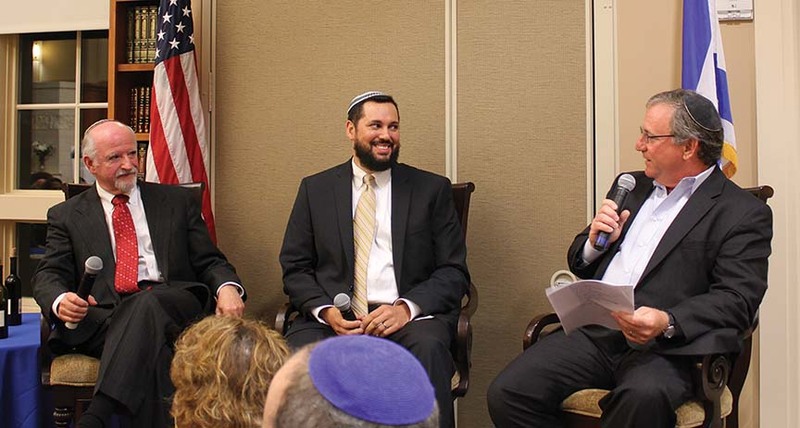 With Eddie Gothard, Rabbi Robert Loewy and Rabbi Uri Topolosky discuss their congregations' joint journey in the years following Katrina. While every Jewish institution was affected by the flood, Beth Israel was one of only two institutions in Greater New Orleans that had to rebuild completely, and the only one that moved to a new location. After the levees broke, Lakeview was one of the harder-hit areas, and Beth Israel had at least 10 feet of water inside the building. Photos of the congregation’s ruined Torahs being removed from the ark in a sanctuary that still had chest-deep water ran in just about every Jewish newspaper following the flood, and became iconic images of the storm’s effect. Eddie Gothard, past president of Beth Israel, said it wasn’t an easy decision to have the commemoration weekend. Many thought there should not be a weekend revisiting the storm, and it couldn’t be considered a celebration, especially given the death of the congregation’s long-time gabbai, Meyer Lachoff, during the storm. Eddie Gothard noted that the congregation is stronger than it was 10 years ago. In his 30 years on the board, balanced budgets were a dream, but since 2006 it has been a reality each year. It was noted that four Beth Israel representatives were interviewed for the JTA national wire service piece about Katrina — and three of them arrived in New Orleans after the storm. Soon after the waters receded, Beth Israel began holding services at Gates of Prayer in Metairie. In 2007, Beth Israel hired Rabbi Uri Topolosky. The Topoloskys left in 2013, but returned to New Orleans for the anniversary weekend. The relationship between the congregations grew, and in 2009 Beth Israel decided its new building would be next door to Gates of Prayer, on land purchased from the Reform congregation. Groundbreaking took place in 2010, and the building was dedicated in August 2012. The Beth Israel history video that debuted at the building dedication was screened during the gala, and a multimedia presentation on “Our Past to Our Present” was narrated by Jackie Gothard and Lee Kansas. A procession from Gates of Prayer to Beth Israel included five Torahs that had been donated by individuals and groups across the country, to replace the seven that had been ruined in the flood. The morning of Aug. 23, Beth Israel Rabbi Gabe Greenberg led a Torah study session at the Beth Israel cemetery, right by where the seven Torahs are buried. Two weeks after the levee breach, Rabbi Isaac Leider of ZAKA made his way to the still-flooded building and removed the scrolls. Leider transported them out by boat, and congregational secretary Becky Heggelund met him at Zephyr Field to claim the scrolls and bury them in her backyard with the help of a neighbor. The congregation later recognized her as a Righteous Gentile. Topolosky recalled Gothard’s comment to visiting groups that most Jews never see the burial of a Torah scroll in an entire lifetime, but this congregation saw seven at one time. A headstone where the Torahs are buried carries three significant dates — the storm, the burial of the scrolls and the date when the headstone unveiling was supposed to be — in an ironic twist, the August 2008 ceremony was postponed due to evacuations for Hurricane Gustav. There was also the burial of 3,000 holy books in the far corner of the cemetery. The weekend began with Shabbat services and a musical Havdalah. The culmination was a packed house for the Aug. 23 gala dinner. Loewy said New Orleans is all about family, and half of the Gates of Prayer leadership had family connections to Beth Israel — not to mention other connections, including how Loewy officiated at the baby naming for Greenberg’s wife in Houston. Topolosky said Katrina pushed the two congregations closer than they otherwise would have been, but also mentioned that the fundraising for Beth Israel’s first building a century ago included significant support from the Reform community of New Orleans. 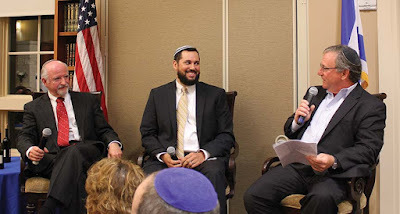 While much was made of how Topolosky and Loewy studied and taught together, along with Rabbi Ethan Linden of Shir Chadash, they said it was not unheard of in New Orleans, with the legacy of the Melton program. The relationship continues during Greenberg’s tenure. After Katrina, “We became the poster children for the concept that Reform and Orthodox congregations, rabbis and communities can work with each other in close, personal ways,” Loewy said. While some feared the visiting rabbi, Joseph Friedman, would walk back to Memphis in disgust, instead he said he was going in to the Reform service. Loewy was told that Friedman wanted to address the congregation. “I can’t say no,” he remarked. Naturally, Friedman would not use the microphone, but “he shared one of the most meaningful and touching moments of worship one could imagine.” He spoke of the midrash about the line in the Kedusha, “Holy, holy, holy,” when the angels turn toward each other. At that point, the angels who usually are rivals reconcile with each other before God. Greenberg closed the evening by relating how Judaism has a blessing for everything, including a little-known one he had never done — a blessing for seeing a destroyed synagogue that has been restored to its former glory.